To many of us Westerners, African art exudes an aura of otherworldly mysticism. We think of intricate masks and figures that resemble beings not human, or ritual objects with mysterious powers that we are unable to exploit. These ritual objects, of course, have incredible cultural value; but in some cases, the everyday and seemingly mundane can communicate an even deeper, richer part of a civilization’s existence. 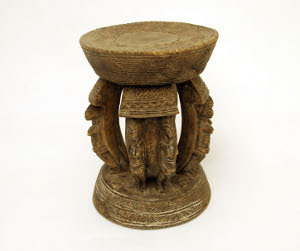 An example that I have found to be unexpectedly profound is African stools. Some are simple, some are elaborate, and the scope of variety is incredible. Aside from the aesthetic value of these objects, they symbolize much deeper aspects of daily life. Not to over-glorify what is often merely a carved piece of wood, many stools are simply furniture, a place to sit, with no deeper significance. But others serve very particular purposes for milestones in life such as births, initiations, deaths, or marriage. Often they are status symbols of the political or spiritual elite, similar to a Western king’s throne. 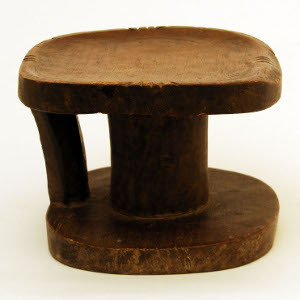 The stool featured above, part of the Muriel and Marcus Zbar Collection, is from the Dogon people of Mali. 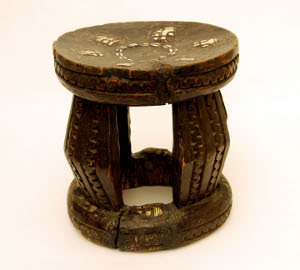 Traditionally, the Dogon worship ancestral spirits called nommo, represented here in the center of the stool. The bottom disc represents the earth, the top disc represents the heaven or sky, and the nommo are the essential beings that responsible for holding the universe together and providing a link between the two worlds. These stools used to be symbols of authority for hogons, or priests, and were never actually used as seats. This one, from the Joseph A. Towles Artifact Collection, is used during the nkumbi initiation ceremony of the Mbuti peoples (Democratic Republic of the Congo). Boys aged 9 to 12 are taken into the Ituri forest to be trained physically and intellectually to enter manhood. The process takes several months and culminates with circumcision. After the initiation, the boys gather in the village and dance on stools like this one to celebrate their successful transition. The exact origin of this stool, also from the Zbar collection, is unknown, but there are distinct features that can give us clues as to its use. The cowry shells indicate that it is certainly from West Africa or Cameroon. The shells, along with the inlaid ivory, suggest that whoever owned this chair had a desirable status within the community. All of these objects and additional stools are viewable on the Lowcountry Digital Library. Similar items to these include neck rests (these have a whole other interesting story behind them!) and East African chief’s chairs, which are much more akin to what we see and use every day. Bocola, Sandra, ed. African Seats. New York: Prestel, 1995. Print. I noticed that a lot, if not all, of the african-american students at my college graduation wore a particular kind of stole. I did a some of research and found out that its called a Kente stole. However, I was wondering if any you knew the historical background and purpose of the stole? Also, do graduates buy the stole themselves or is it given by the Office of Minority Student Affairs? I was confused as to the history, purpose, and distribution of the stole because I noticed from my friend’s recent 2010 graduation, that just about everyone also had on the same Kente stole, including non-minority professors and students. Can anyone tell me more about the Kente stole?